employment. There are total ERPO vacancies available in SCI Recruitment are 50 posts. Candidates who are eligible for this ERPO vacancies are requested to follow the instructions from SCI official notification and appear for Walk in Interview. Interview will be held on 30-November-2017 (Thursday) at 10.30 AM. Candidates have to gather at SCI Head Office, 17th floor, Cafeteria on 30-11-2017 to attend for Interview. After completion of Document verification and Interview process, selected list of candidates will be placed on SCI official website. After selection candidates will be paid Rs. 14170/- for ERPO-1 and Rs. 10,000/- for Trainee ERPO. 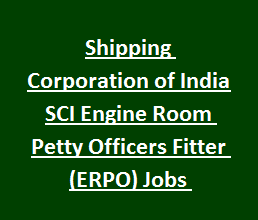 Full details of Shipping Corporation of India Limited SCI Recruitment of 50 Engine Room Petty Officers (Fitter) & Trainee Engine Room Petty Officers (Trainee Fitter) vacancies Selection method, Application process, Interview venue, monthly wages, age details are mentioned below. Walk in Interview Date: 30-November-2017 (Thursday) at 10.30 AM. Total vacancies available in Shipping Corporation of India Recruitment are 50 posts. Age limit for ERPO recruitment vacancies is 45 years and for SC/ ST candidates is 50 years. Age limit for Trainee ERPO recruitment vacancies is 30 years and for SC/ ST candidates is 35 years. Diploma in Mechanical Engineering from a reputed Polytechnic or National Trade Certificate NTC in Fitter or Motor/ Diesel Mechanic or Welder or Machinist trades issued by National Council of Training in Vocational trade NCTVT or Industrial Training Institute of State govt (ITI). 02 years trade apprentice certificate in Fitter or Motor/ Diesel Mechanic or Machinist trades from Govt approved Shipyard. Walk in Interview will be held on 30th November-2017 for eligible candidates by designated officers from FP Department and Operation Departments of SCI. After the verification of Documents and Interview, selected list of candidates will be placed on SCI Website. Selected candidates will be sent for medical examination. This list of selected candidates will be valid for 6 months from the date of publication.